Any business or person who constructs a new home will need to have a valid Certificate of Registration. It’s a requirement for Home Improvement Contractors to be registered. If you do both types of work, it’s required to hold two registrations. Any construction projects that exceed specific limits will need to be registered as “Major Contractor.” The building officials are prohibited against issuing construction permits or building permits to a builder, unless they have a copy of a builder’s valid Certificate of Registration. There are certain types of work that is entailed when it comes to new home building, as well as home improvement that will require extra education, training, and licensing. View the state website for more information regarding the trades, as well as the level of credentialing and expertise that is a requirement within Connecticut. Violators could be subject to suspension or revocation of their registration to work, arrest and criminal prosecution, and $1,500 per violation for civil fines. Complete and send an application to the commissioner with the following: a $240 fee, worker’s compensation, agent for service of process, and a proof of liability insurance. Any person who receives a certificate will also need to pay a fee of $480, biennially, into a New Home Construction Guaranty Fund. Experience, Exam, and Education Requirements: Are There any Requirements For the Contractors License? There are no requirements to obtain a certification. There are occupational trades, such as heating & cooling, plumbing, home inspection, and electrical, etc. that will require licensing and passing of the Business and Law exam, as well as trades exams through PSI. There is detailed information regarding obtaining a license and exam for a specific trade, which can be found within the Connecticut state website. Contractor Continued Education: Is it Required in Connecticut? Each of the certificates will expire biennially. There is no continued education that will be required during this time for renewal of the Certificate of Registration. 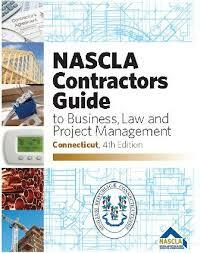 NASCLA Accredited Commercial Contractor License: Is it Accepted in Connecticut? General Contractor Commercial Contractor License: Does Connecticut Require One? The general contractor needs to be certified to perform New Home and Home Improvement Construction. Certain trades will need to be licensed. Are There Reciprocity Within Other States? No there isn’t. Any out of state contractors will need to file an Application of Registration within the Secretary of State, satisfy the bonding requirements, register with Connecticut Department of Revenue Services for tax ID numbers, obtain workers compensation insurance, and obtain an appropriate trade or occupational license. Required for ALL Contractor/Dealer Tech Licenses. The Business and Law examination may include questions that appear not to directly relate to your licensing category. However, this examination and those questions are testing your general ability to research information. Question: How do I register my construction company in Connecticut? What forms do I need to register my new company in Connecticut? Question: How do I look up a company in Connecticut or see if a company name is available to register?